Project Shark is back! After the huge success we had with Project Shark: Galapagos, we have decided to launch Project Shark in French Polynesia. The aim of Project Shark: French Polynesia is to highlight the global issues facing sharks, with a French Polynesian focus, as well as enjoying some of the most exciting dive sites French Polynesia has to offer. The week will involve some fantastic diving with a chance to learn about the biology and behaviour of sharks and enjoy close encounters with a range of shark species’ in French Polynesia. You will be joined on board for the duration of the safari by our experienced blue o two Project Shark trip host, Dr Elke Bojanowski. - Experience potential close encounters with a range of different species of sharks including oceanic blacktips, silvertips, tiger, silky, whitetip reef shark, blacktip reef shark, grey reef shark and scalloped hammerhead sharks. Project Shark is delivered by our resident marine biologist Elke Bojanowski Ph.D, who will conduct seminars giving divers the opportunity to gain a better understanding of the biology and behaviour of sharks. There will also be a chance to learn about globally endangered marine species and what as divers we can do to aid their protection. Founder of the 'Red Sea Sharks Trust', experienced dive guide and marine biologist, Dr. Elke Bojanowski began the Longimanus Project in October 2004 and ever since she has been actively collecting underwater photographs and video-clips of oceanic whitetip sharks for catalogue, review and analysis. Since 2012 the project has expanded to become Red Sea Sharks (www.redseasharks.org) and increased its scope to include grey reef and silky shark catalogues and monitoring for many shark species. Encounters with endangered species allows divers to add a greater purpose to their French Polynesia holiday, so anyone who has an active interest in the preservation of the marine environment and its inhabitants would enjoy this itinerary. However, it is important to bear in mind that as well as learning from experts about marine bio-studies within French Polynesia, divers will enjoy exciting diving with possible encounters of some of the largest pelagic animals on the planet. The Project Shark: French Polynesia itinerary provides divers with an unparalleled opportunity to study the marine life's natural behaviour and aid future conservation efforts in support of marine conservation projects. Diving in French Polynesia can be challenging, even for the experienced diver, primarily due to the currents. We recommend being qualified as PADI Advanced Open Water Diver or equivalent and have a minimum of 50 logged dives, preferably with some experience diving in currents, and Nitrox certified. French Polynesia also has more stringent scuba diving regulations to which we must adhere, pertaining to depth limits, number of dives per day and unguided diving. If you have any questions, please contact our dive travel team for more information. Your scuba diving holiday in French Polynesia will leave you with unforgettable memories and breath-taking experiences. It is undoubtedly one of the top diving destinations around the world and even the most widely travelled divers can encounter something they have not seen before. 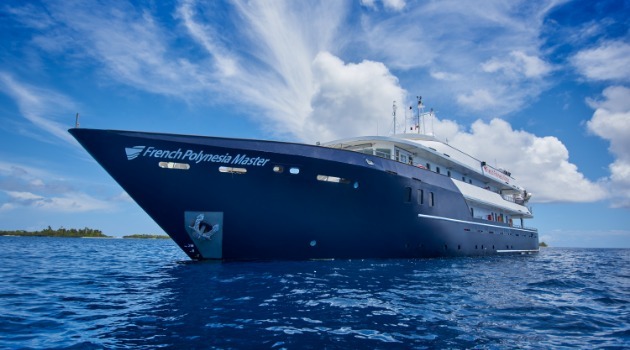 The following is a description of the dive sites we may visit during your liveaboard safari as M/V French Polynesia Master cruises between Rangiroa and Fakarava. We have included the highlights below, however the vessel may stop at numerous smaller islands along the way including Arutua, Kankura and Niau. On a typical 10-night itinerary we will offer up to 30 dives with a maximum of 3 dives per day (inclusive of any night dives). The itinerary below is an example of the planned route and dive sites cannot be guaranteed. All dives sites are subject to weather conditions and the final route taken is at the absolute discretion of the captain and dive guides. Adverse weather can affect this route which includes several overnight sailings. Select the cabin of your choice and enter your personal information. Submit the booking request. Once the booking is processed, you will receive an email notification with all booking details conveniently laid out in PDF. Our team will contact the liveaboard on your behalf to confirm availability and other booking details. We put your place(s) on hold and get back to you within 24 hours. If there are any issues, we come back to you with alternative options. A group is defined as 6 or more spaces booked with customers travelling on the same vessel, on the same departure date, under the same booking reference. *Greater than 365 days prior to departure, we will honour the 2% deposit that we are holding against the booking, provided a minimum of 1 person travels on the same departure date, under the same booking reference, in the same accommodation. blue o two can accept payments over the phone by debit or credit card, or by bank transfer. If you wish to make payments in other currencies, please contact your Reservations Consultant for the details. For customers paying in any currency apart from USD, the final price can only be confirmed at time of booking. This is due to fluctuations in exchange rates. blue o two reserves the right to cancel a booking at any point where payments have not been made on time.